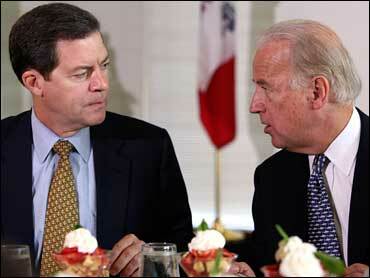 Presidential candidates from opposing parties, Democrat Joe Biden and Republican Sam Brownback, took the unusual step Friday of holding a joint event to tout their proposal for a political solution to the war in Iraq. Biden, who is chairman of the Senate Foreign Relations Committee, has been the most prominent advocate of a plan in Congress that would limit the power of Iraq's central government and give more control to three ethnically divided states. "We often don't agree ... but one thing we agree on is that the solution to our situation in Iraq is, quite frankly, more important than who among us will be the next president of the United States of America," Biden said. Brownback and Biden sponsored a nonbinding resolution laying out the plan that won Senate approval last month on a 75-23 vote. The resolution was attached to the defense authorization bill as an amendment. Brownback, a Kansas senator, said reaching across party lines to find a solution in Iraq marks the first time in recent history that opposing parties campaigning for president shed their political labels and came together. "It is my hope that our appearance will resonate with the vast majority of voters in the heartland who don't want any particular party to win on the Iraq issue but do want America to win," he said before the event. The senators appeared together before the Greater Des Moines Committee on Foreign Relations, a civic group that promotes solutions to foreign policy problems. Brownback said the Bush administration's military surge has had some effectiveness, but it's now time for a political response. "Now we need a political surge," he said. "That's what this represents." He said the administration should appoint someone like former Secretary of State James A. Baker III to travel to Iraq and promote the federalism approach. Said Biden, a Delaware senator: "There are thousands of people dead, carnage is reigning, a civil war is there. The idea that Iraqis will spontaneously put this together is not realistic." In the most recent Iowa Poll conducted for The Des Moines Register in early October, Biden was supported by 5 percent of likely caucus-goers. Brownback, who acknowledged this week he needs to finish fourth or better in the caucuses to keep his presidential campaign alive, had 2 percent.